When we were invited to the Danchuk Tri-Five Nationals in Bowling Green, Kentucky, we immediately thought of two reasons we needed to be there. 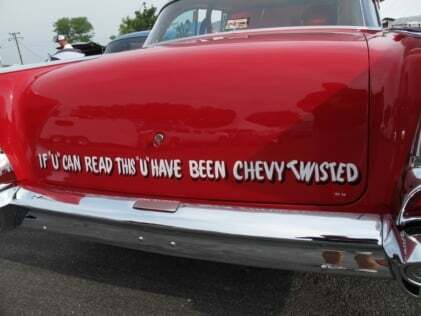 First, it’s an event that is dedicated to any Chevy built in 1955, 1956, and 1957. What could be better? Second, was that the event is held at the fabled Beech Bend Raceway in Bowling Green, Kentucky. A gathering of iconic cars at an iconic location? Count us in. 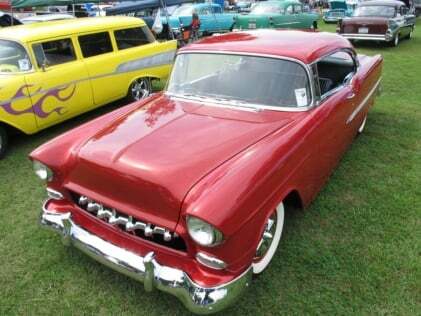 The Tri-Five Nationals gives enthusiasts everything to see from racing to show cars, to a huge availability of parts. If it’s Tri-Five related, it’s here. Bowling Green is not only the birthplace of every Corvette since 1981, but now, it is also known as the go-to location for the world’s biggest gathering of all things Tri-Five Chevy. 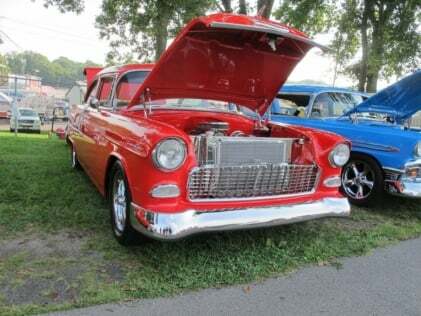 This was the third year that The American Tri-Five Association converged on this historic town, and this was also the year that the ’57 Chevy celebrated its 60th anniversary. When was the last time you saw a convertible four-door ’55 Chevy? Definitely a one-of-one home-built creation. When we first arrived at the host hotel to get our credentials, we were greeted with the news that preregistration had already surpassed last year’s total car count, so things were looking to be a great weekend. The racetrack doesn’t open to show cars until Friday, but the Thursday evening gathering at the host hotel was filled to capacity, with every imaginable build style in attendance. If you like your Tri-Five in perfectly restored style, you had plenty to see. 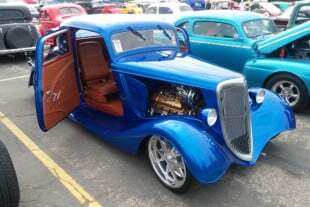 If restomods or even gassers are more to your liking, there was more eye candy than one person could possibly take in. Sure, it was a little on the warm side as we walked around the more than…oh heck, we couldn’t tell you how many hundreds of cars were at the pre-show gathering, but we made sure that we saw them all. When the sun finally started to set, the party seemed to continue. If you needed parts, there were more than a few on hand. It is hard to comprehend that cars limited to only three model years can so popular that they can fill a vintage facility like Beech Bend. Parking was such a premium, that nobody wanted to move their cars for any reason. 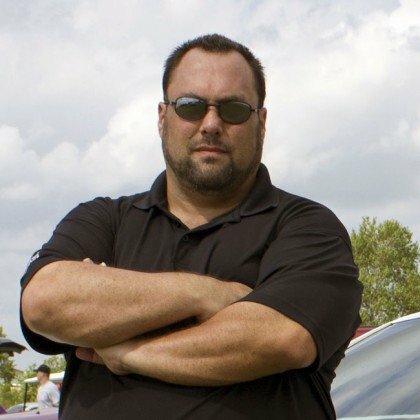 It was literally wall-to-wall Chevy’s. Because it has been 60 years or more since any of these cars rolled off the assembly line, you would think that any new ideas used in rebuilding these iconic cars would have been played out. We’re here to tell you that they have not. 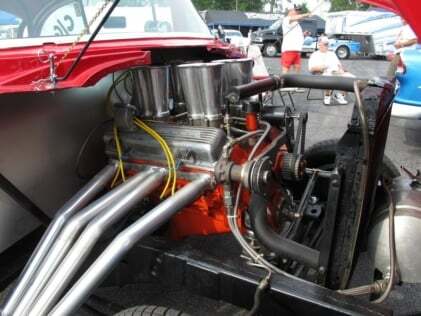 The ingenuity of enthusiasts and the innovation and skill that many hot-rodders possess was truly unparalleled with this crowd. We saw things we could have never imagined. Ronald and Brenda Stevenson of Newnan, Georgia, brought their gorgeous ’55 that was powered by a Ram-Jet-outfitted 502 big-block and an automatic transmission. All of this classic Tri-Five overload was capped off when the announcer let everyone know that more than 2,700 cars had filled the grounds. But, not only could take in the show cars, but racing action and parts availability was something that a lot of people took advantage of. 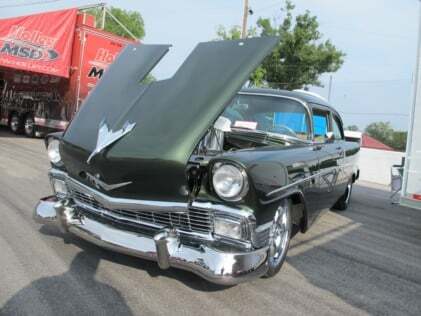 Friday also saw Street Outlaws’ regular Jeff Lutz debut his new ’57 Chevy. This bright yellow sedan not only looked like a million bucks, it ran like it as well. John and Karen Neiding and their ’57 hail from the state of Ohio. If there is one way to kill a car show, it’s to have rain make an unwelcomed appearance. Unless you’re at the Tri-Five Nats. Spectators and participants alike didn’t let the Friday night and Saturday morning rain dampen their spirits, and Saturday saw even more cars claim the hard-to-get prime parking spaces throughout the event. If you’re into seeing some of the latest trends and some of the most outrageous cars, then the Top 25 cars were definitely something to see and possibly emulate when you got home. Not only was there the Top 25, but at the end of this fun-filled weekend, the Top Five cars of the event were chosen, and one of them became the Tri-Five of the year. The top five show cars of the event. We were surprised that even though this was the year of the ’57, only one made the cut. Maybe racing action is where your appreciation gathers, and the nearly 200 racers featured everything from show-stopping cruisers to 200-mph door slammers. The swap meet area, and the Speedway Motors tribute to gassers, was something that not only caught our eye, but our imagination as well. Maybe we need to build one of these! Gassers were all the rage on the track and show field. When the event was drawing to a close, it was standing room only near the dragstrip tower as the giveaway car made its way to center stage. Each year, the folks at Woody’s Hot Rods assemble a car that is given to one participant of the event. This year, the guys built the car using a brand-new, steel, 1957 body and a gasser chassis from No Limit. 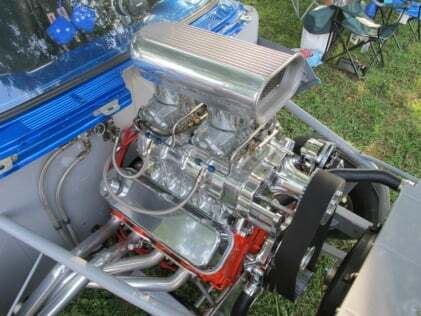 The red white and blue flyer had a Hilborn-injected 502ci big-block Chevy with massive fenderwell headers. We can’t recall the first name called as the winner, but after the five-minute waiting period was over and she didn’t make her presence known, another name was drawn. Imagine finding out later that your name was called and you were gone. That’s gut-wrenching thought is enough to keep us around until the very end. Next up was Fiano Guzzo of Waterborough, Maine, who became the most envied man at the event, as he wasted no time making his presence known. As he made his way through the crowd, we could only have hoped it was us making that walk to center stage. At the end of the festivities, Fiano Guzzo was surely the happiest guy in attendance. If you missed this year’s event, you can check out all the action-packed images below. Also, make your plans to attend next year’s event, as it was announced that the 2018 Tri-Five Nationals will be held August 10 and 11 of 2018. We’ll be there, and we hope to see you as well.